I have to confess from the start that I am in no way a hamburger fan, not out of culinary snobbery, but because to my mind the dish usually consists of a pointless hotchpotch of low-quality ingredients (of which more below). While it is today an ubiquitous and familiar concoction whose image insistently stares at us from countless restaurant frontages, magazine and newspaper pages, and cinema and TV screens, some uncertainty surrounds its origins. There is little doubt that its name is connected with the German city of Hamburg, which was a major point of departure for Germans emigrating to the US in the early 19th century. A centuries-old snack called Rundstück warm (literally ‘a warm round piece’) is still served in cheap restaurants on Hamburg’s dockside. It consists of a round bun garnished with leftover roast pork and various condiments. Not all food historians see a connection between this dockers’ snack and a Big Mac. But it seems unlikely that the resemblance between the two dishes could be purely the result of a coincidence. Some argue that the Rundstück warm did in fact migrate to the US, but was so difficult to pronounce that Americans soon changed its name to hamburger. 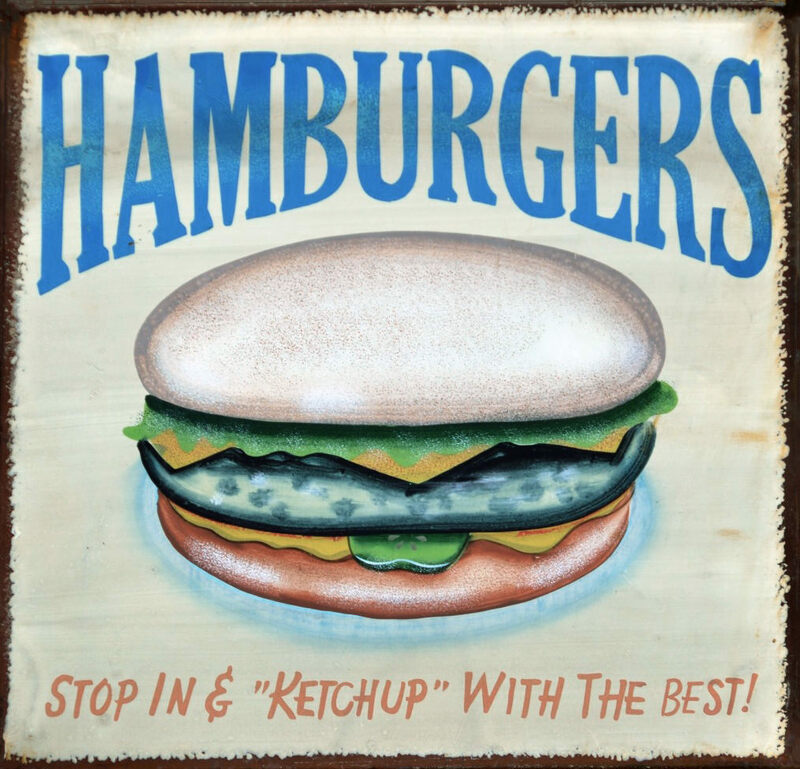 The hamburger as we know it today popped up in various parts of the United States in the late 19th century, with several vendors, particularly at trade fairs, laying claim to its invention. Very soon, the back formation ‘burger’ appeared, as a result of a misapprehension that ham was necessarily an ingredient of a hamburger. Hence the subsequent appearance of a host of burgers indicating their main contents (cheeseburgers, veggie burgers, turkey burgers, buffalo burgers and even naan and kimchi burgers). Today, thanks to shrewd advertising and ruthless marketing, McDonald’s has managed since it was founded in 1955 by Ray Kroc to make its brand almost synonymous with the hamburger product. In any case it towers above its rivals on the hamburger market, serving 550 million Big Macs to Americans each year and millions more elsewhere in the world. And yet the products manufactured by McDonald’s and its main rivals, Burger King, Wendy’s and Quick, are of very poor quality. Compared with other forms of fast or street food (such as pizzas, sandwiches and so on), the hamburger has a lot of drawbacks. Typically it is constructed vertically, often with several ‘decks’, or layers, that stretch one’s jaws painfully and make its consumption a perilous exercise. There are several videos on the internet explaining how to hold and eat a multi-storey hamburger without its contents spilling out. The Japanese, in particular, have done the most thorough research into the problem, A Japanese television show got three researchers – experts in fluid mechanics, engineering, and dentistry – to spend four months trying to figure out the best way of coping with a jumbo hamburger. The researchers did a 3D scan of a hamburger, trying to understand how the ingredients interact when you hold a large hamburger. They showed that the usual way of gripping a burger tightly with your thumbs underneath and fingers on top tends to squeeze the contents out of the buns. The dental expert advised customers to warm up their cheek muscles before eating a big hamburger by opening and closing their jaws a few times. In the unlikely event of your never having sampled a hamburger, let me list its typical ingredients. First comes the upper half of a brioche-like bun, soft and spongy as a pillow, and totally tasteless apart from a certain sweetness. It is usually sprinkled with sesame seeds, an otiose practice as sesame seeds do not acquire their distinctive taste until roasted (which they are not). The top encloses the ‘burger’ itself, a greasy patty of minced beef, which may or may not be jazzed up with a wilted lettuce leaf, onion slices, some pickles, mustard, ketchup and a sliver of insipid greenhouse-grown tomato. All this rests on a thin square of processed cheese which instead of melting properly just droops at its four corners (indeed, there are videos on the internet of a lighted match being applied to this so-called cheese, which instead of melting simply shows scorch marks). Sometimes a second, or third, or even fourth deck of ingredients is included in the hamburger. The concoction is enclosed by the base of the bun. Out of curiosity, I googled the words ‘hamburger’ and ‘lockjaw’. To my amazement, the search revealed that an Englishwoman who was rash enough to try to get her teeth round a multi-storey hamburger did actually dislocate her jaw when doing so and had to have it clicked back in place by a doctor. Even more grotesque is a restaurant in Bristol (UK), the Grillstock Smokehouse, which serves a Lockjaw Hamburger TM, a towering assembly of two patties, burnt ends (smoked brisket), pulled (shredded) pork, two layers of ‘cheese’ and various bits and pieces of vegetables. Photographs of the object suggest that it had to be propped up or glued together in order not to topple over during the shoot. At the other end of the market, some posh restaurants now propose hamburgers containing foie gras, truffles and other expensive ingredients. A nice but silly conceit. But without going to such extremes, the principle of a hamburger (a round sandwich enclosing possibly tasty ingredients) can produce edible food as long as you eschew the big burger chains. This is no problem in Paris for example, where, at the time of writing and in accordance with the current French craze for all things American (including ‘food trucks’), there were no fewer than 106 gourmet bistros offering their own souped-up hamburger versions. The problem in my case is not so much the fillings used in such hamburgers (which can be perfectly respectable), but my aversion to the almost ubiquitous sweet bun. I say ‘almost’, because there is one well-established bistro in the French capital that intelligently replaces the bun with two slices of toast: the excellent Willi’s Wine Bar in Rue des Petits-Champs. And the Belgian restaurant chain, Léon de Bruxelles, offers hamburgers enclosed at top and bottom by a really crisp galette of shredded potato. In case you still have a sneaking suspicion that mass-produced hamburgers may not be as inedible as they are claimed to be by many (including myself), let me give you some more facts. Reports abound of how Big Macs, after being forgotten in, say, an overcoat pocket, have emerged several years later seemingly unchanged in appearance. Len Foley did a controlled experiment which involved leaving hamburgers from various manufacturers in plastic containers for 30 days at room temperature and monitoring their appearance with a camera. All of them developed lively excrescences of fluffy mould – all, that is, except the Big Mac, which looked as ‘mouthwatering’ as ever. In a similar experiment, Canadian photographer Sally Davies bought a McDonald’s Happy Meal – a hamburger and chips (French fries) and took photos of it over a considerable period of time. After day two, she offered it to her dog, which showed no interest in eating it. After three years the hamburger did not look any different, despite being kept at a normal room temperature. Its only change was that it had turned rock hard. McDonald’s marketing has been brilliant. The company has invented McDonald-speak: its outlets offer McDouble Sandwiches, McWraps, McNuggets, McGriddles, McMuffins, McCafé, McRib, McFish, McBaguettes and McBites. The company’s target group in all its advertising is children. It has fended off several attempts by local authorities worldwide to force it to lower the salt, fat and sugar content of its products. When, in 1979, Mcdonald’s officially opened its first operation in France, that bastion of gastronomy, the French were dubious, claiming that fast food would never catch on in their country. And the company did indeed get off to a shaky start. This was partly due to the fact that it simply imported the American recipe for meat patties, which contain an unhealthy dose of fat. The French were used to their steak haché (minced steak) being virtually fat-free, and took a dislike to the McDonald’s patty. But when the company made its recipe leaner, the French went for Big Macs in a big way. McDonald’s now runs more than 1,380 restaurants in France and employs 70,000 people there, making it the second biggest hamburger market in the world after the US. But through shrewd fiscal optimisation schemes that juggle with profit and loss in various tax havens like Liechtenstein and Switzerland, it manages to pay almost no company tax. It would be nice if McDonald’s decided to redirect its efforts into gastronomic, rather than fiscal, optimisation. But I somehow doubt that it will. Why change such a nice big earner? Completely agree. The really baffling thing for me is WHY burgers have become so popular and ubiquitous - gourmet or not. And it's not even just to do with fast food. A recent documentary on French television pointed out that there is practically no restaurant in France that does not have a burger of some kind on its menu. What is going on?